Pumpkin spice season is among us. Whether to you this season means an iced latte in sunny California or a hot one amongst the falling leaves of the East Coast, your employees will benefit from a little extra boost of motivation (caffeine or otherwise) as we enter the last months of the year. Here are three strategies to incorporate into your company’s fall schedule that will boost employee engagement without stepping outside of your budget. A fresh take on business may be just what your employees need a boost of inspiration. Invite a community leader, owner of an employee favorite restaurant, or even a coach at the local university, to share their story and motivate employees. Not only will a fresh face likely hype up your team more than a typical motivational meeting, but can also build community relationships and create possible partnerships. Underground Elephant has taken this concept and turned it into a weekly speaker series titled “Startup Talks in the Park”, that allows employees to ask questions and hear business tips from other industries. Increasing employee engagement doesn’t have to break the budget. Combat the office blues with a trip to the great outdoors… or at least a nearby park. If weather permits, suggest a walking, afternoon meeting. Not only will the switch from fluorescent to natural light be a literal breath of fresh air, but this Inc. article suggests being in nature for even a few minutes increases productivity levels. Reward your employees with a fun, fall-themed event. Take a trip to a local pumpkin patch, hold a costume competition, or even host a company tournament. Recently, Underground Elephant hosted a fall “kickoff” kickball tournament; gamification is a concept the UE crew has mastered. 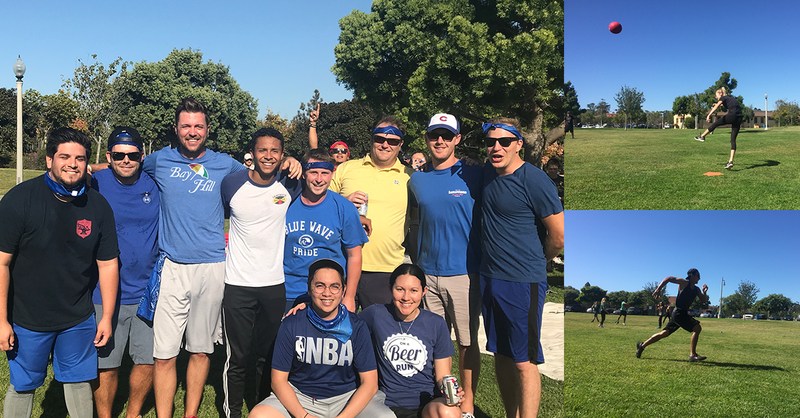 The kickball teams were created to allow members of different departments to get to know each other in a fun, competitive atmosphere, laying the groundwork for greater collaboration amongst departments in the office as well.